The first time I had German Chocolate Cake was when I was a teen. I was at my friend’s house, and we decided to bake a cake. One taste of the Pecan Frosting and I was hooked. It was amazing. Moist delicious chocolate cake paired with a nutty coconut frosting. I wanted to recreate that flavor sensation all over again. This cake brought back so many memories, I was back in time. I love this cake, I made it as my birthday cake this year. Even though I didn’t make the cake from scratch…..I KNOW! It was still wonderful!! 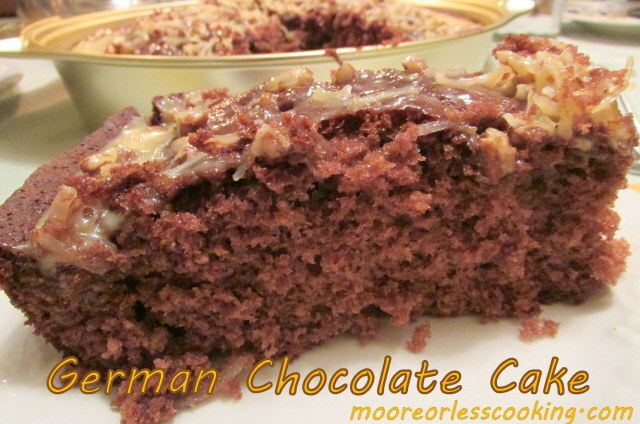 This German chocolate cake is so delicious with it's amazing Coconut Pecan Frosting. In large bowl, combine cake mix, water, 3 eggs, oil and ⅓ cup sweetened condensed milk. Beat on low speed until moistened, then beat on high speed 2 minutes. Bake 40 to 45 minutes or until wooden toothpick inserted near center comes out clean. In small saucepan, combine remaining sweetened condensed milk, egg yolk and butter. Over medium heat, cook and stir until thickened, about 6 minutes. Add pecans, coconut and vanilla; spread over warm cake. Store leftovers covered in refrigerator. Another gorgeous cake Nettie…perfect for holiday entertaining! This is one of my faves from childhood. Makes me so happy to see this! Must try! One on my favorite cakes! Love German Chocolate! Yum!